Select an appropriate instrument in the toolbar to draw an object. The properties of selected objects can be changed in the inspector toolbar (the second row of toolbar). If you need to precisely draw some small objects you can zoom in the image using slider in right bottom (Pro only). The button 1x and Alt+click (Option+click on Mac) on plot fits the image to the window. Every object can be selected by clicking on its border or inside it. Hold Ctrl key (Windows, Linux) or Shift key (Mac OS) and click another object to add it to current selection. 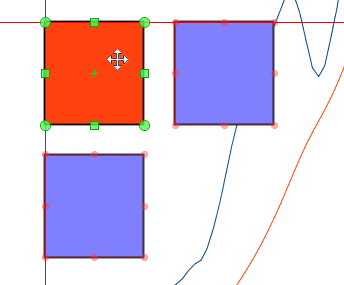 When objects overlap, you can change the order of objects drawing. 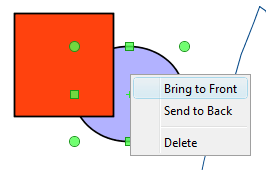 Use Bring to Front and Send to Back items in object context menu (right click on object to open menu). You can change the order of drawing the curves on Figure. The curves order can be set in Figure Properties window, Axes Properties tab → Components tab. Select desired curves in list, then hold Alt and press up/down arrow keys. You may also use Move Up and Move Down items in Waterfall button menu. When you drag an object or change its size, MagicPlot will try to snap the bounds of this object to other objects. 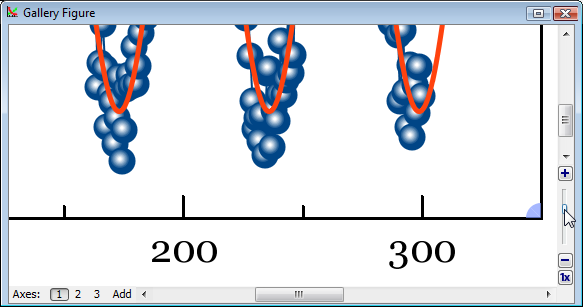 While snapping MagicPlot shows you a red ruler and an object to which the bounds are snapping. If you do not want to align your objects this way, hold Ctrl key to disable snapping.